All tax tables (Federal, State and Local Income taxes and any applicable State Unemployment Tax Tables) are created and maintained here. The Tax Table section is designed to follow the format of the Annual Tax Table found in your Circular E and in your state and local income tax booklets. 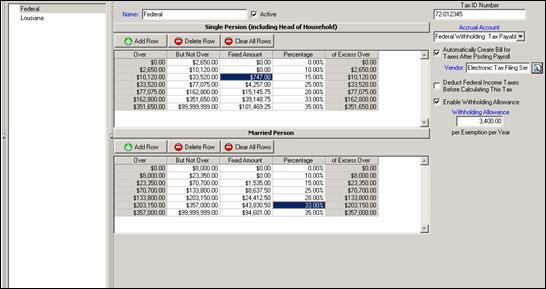 Click the New button on the right to add a new Tax Table. In the name area, enter a description of the tax table (for example, Federal Income Tax). Check the “Active” box if this is a current tax being used. Under the Single Table, select the Add a Row button. Fill in the columns exactly as outlined in your booklet. Follow the same procedure for the Married section. Fill in your Tax ID number. Enter the GL Accrual account number this tax will be posted to. If you wish the system to automatically calculate and create a voucher for your tax payment, check the “Automatically Create Bill for Taxes After Posting Payroll” box and enter the vendor name. Click Save to save the new tax table. State and local tax tables are set up the same way as Federal tax tables in Control. Simply follow the same steps as listed above for setting up a Federal tax table. Some states allow Federal withholding to be deducted before calculating State withholding; if this applies to your state, check the box “Deduct Federal Income Taxes Before Calculating This Tax”.